Whether you need high school graduation announcements or your grad is finishing up college, we have the perfect card waiting for you to design with your favorite photos. From announcements and invitations to simple graduation greeting cards, you can upload any photo and create an artistic layout that showcases your senior’s best moments. Furthermore, you can add your own text. Include your ceremony’s date, time, and place. In addition, you can write a congratulatory message on the inside to brighten your grad’s big day. 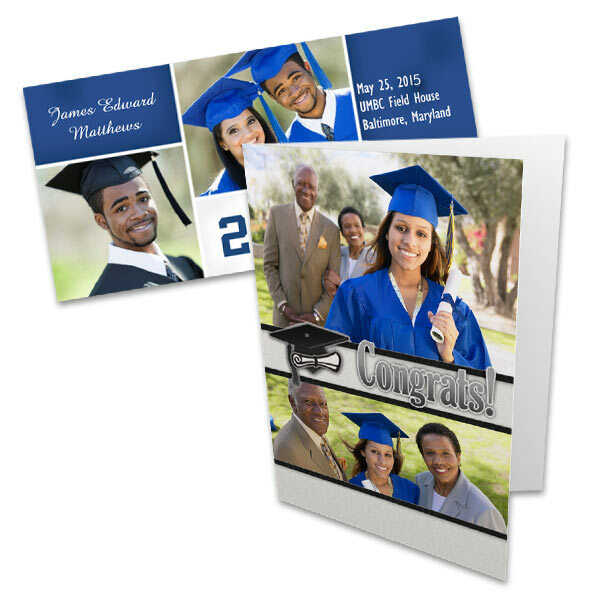 Choose from photo paper, card stock, and folding photo card options in an array of templates to create the perfect greeting for your grad’s achievements. Don’t forget to commemorate the big day with a Graduation Photo Book! We offer a variety of books sizes and styles that you can design yourself from front to back with your most cherished graduation memories.